UPDATE | Police have confirmed the 84-year-old female driver of one of the vehicles has died. The second driver suffered non-life threatening injuries. An investigation is ongoing. 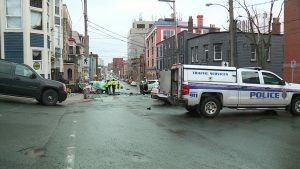 PREVIOUS | There has been a serious high-speed collision in downtown St. John’s this afternoon. The accident occurred shortly after 1 p.m. on Duckworth Street, just east of Church Hill. Witnesses say there was a minor collision closer to Prescott Street and the vehicle drove off at a high rate of speed, colliding with a second vehicle and possible a third vehicle before crashing into India Gate restaurant. Police are looking for witnesses to the accident and are in the process of obtaining CCTV video. They are asking anyone who may have any information about the collision to come forward. 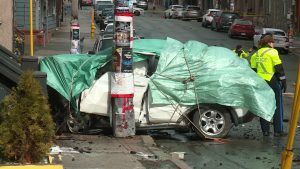 The accident forced the closure of both Duckworth Street and Church Hill for several hours.